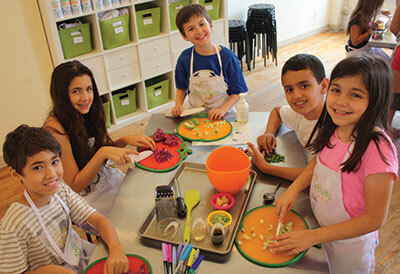 We host creative and unique cooking classes and events for kids, families, age 2 to 99. Our bright and spacious kitchen studio is custom-designed for kids by day and is adult BYOB by night. From single-day parent/child workshops to semester-long classes, budding chefs age 2 to teen whip up culinary adventures as we develop the skills to chop, mix and swirl our way to a food masterpiece. We also offer our programs in schools and other off-site locations. When school is closed, we're open! We offer 3-hour camps on every school holiday. And all summer long, we explore a new culinary adventure each week during our hands-on summer cooking camps. Age 4-13. Celebrate your child's special day in culinary style. We reserve our entire kitchen studio just for you. We take care of all the details so you can sit back and enjoy. We can even bring the fun to you! Our gingerbread house decorating workshops are a ''must do'' family tradition. Create special memories with your child during the holidays. We also make Halloween Haunted Houses in October and Valentine's Love Shacks in February!